Cover your sun-baked patio or outside space with a shade product from D&K Home Products. All D&K deck, patio and enclosure components are constructed from high-quality structural aluminum guaranteed to never rust, warp, crack, rot or host internal insect infestations. 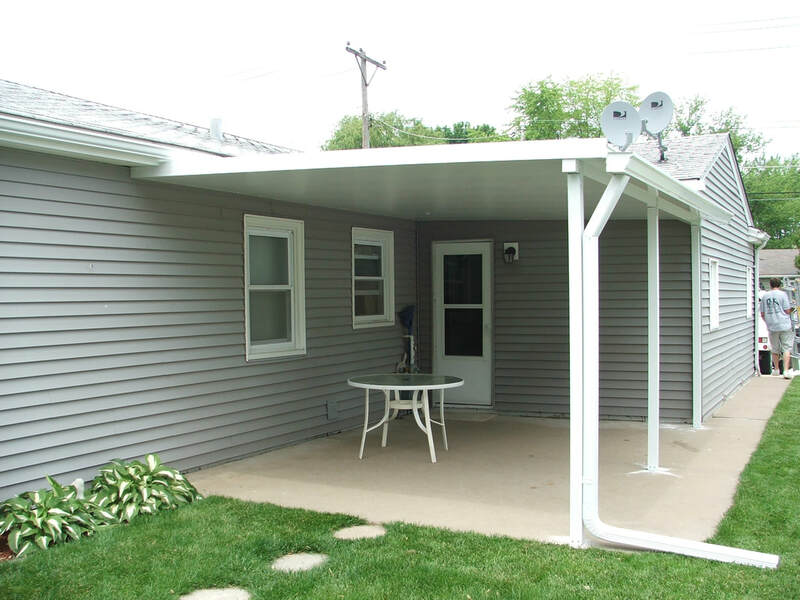 All materials are factory-finished aluminum and retain the original color, gloss and texture longer than any currently available alternative material, and are structurally engineered for wind and snow load. Start with a strong, versatile base. Our laminated roofing panels are made with the same expanded polystyrene foam specified by architects nationwide for energy efficiency. Insulated Roof Panels result in a strong and durable patio cover that reduces the heat from direct sunlight by 20% providing a shady refuge on hot summer days. Designed to accommodate ceiling fans, light fixtures and other ceiling-mounted accessories, an insulated roof is an excellent choice. Flat Pan or "W" pan roofing provides economical shade that protects you from inclement weather and harmful UV rays. Great solutions for carports, walkways or small patios. This roofing option combines the insulating properties of laminated roofing panels with added strength and style of embossed aluminum rafters. Choose from scallop, bevel, miter and corbel profiles. Enhance your outdoor space with additional options from D&K Home Products. Not your grandma's patio cover anymore! Many options are available for covering your outside space. Patio covers have come a long way. Illumaview light skylite panels, Litestrips, to "light your way", hidden gutter systems, column options, color options, and exterior fans. You design it! Download the file below and view some of the options available! Customers ask for pricing for budgeting all the time, its important to understand that our products are custom designed and pricing is difficult to do without viewing the project location. Rule of thumb for pricing a patio cover begins with the product itself. Sq footage is determined by width x projection. That will give you the square footage. A rough price for the product ranges from $8 to $30/sq ft. This sq footage price can vary by the type of cover. Additional items, such as installation, footings, cut back, special posts, columns and engineering can add to that price.